Beach Ya To It~ Pure Luxury with Lots of Leather Seating in Living Room! Spectacular New Coastal Home Perfect For Your Getaway!!! Property Size 2,078 sq. ft. Brand New Beach Custom Built Home Located in the Tropical Gated Community of Emerald Waters Village - 4 bedroom 3.5 Bath, 2 Master suites, 2 Laundry rooms. Emerald Waters Villages offers two Community swimming pools. This Fabulous private community is located on the East side of Holiday Road in Miramar Beach near the corner of Scenic Gulf Drive and Frangista Beach. This secluded neighborhood is close to tons of shopping, dining, golfing, and entertainment. Destin Commons is a favorite Shopping area in Destin as well as Silver Sands the nation’s largest Designer Outlet in America. Anchor stores in Destin Commons include Bass Pro Shop, H&M Store, Belk and Uncle Bucks upscale Bowing alley. Silver Sands boasts designer stores such as Michael Kors, Tommy Hilfiger, Polo Ralph Lauren, Calvin Klien, and Coach. Close by you will also find Whole Foods and Publix Grocery. There are so many nearby activities and places to enjoy. The Private Beach Access is just 2.5 blocks away and we offer a large rolling cart with several beach chairs as well as a complimentary golf cart. Community Pools are open year round. 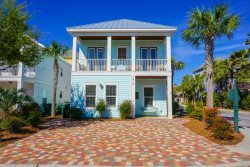 Walking distance to Pompano Joes for dining on the beach, Volley ball and Beach Bar. Alvin's Island Store with fun beach gear and ice cream is right on the corner. Chex out our floor plan! Covered Porch, Carport, both with Patio furniture. Storage closet off of Carport has Rolling beach Cart, Bech Chairs, Umbrella and an ice chest for your use. Living, Dining, Large Breakfast Bar. We have an additional Beverage Cooler and under the counter Ice Maker in Kitchen. Powder room has a beautiful Vessel Bowl. Master is on first floor with King bed, and a huge TV . Master bath has a Double vanity, 5' Walk in Shower, Walk in Closet with Stack Washer Dryer! Additional small living area with Sofa Sleeper and Large TV., walk out to large covered porch with Seating. King Master Bedroom with Private bath, Additional King Master bedroom, Hall bath with Double vanity and Tiled Tub/Shower. The 4th bedroom has custom built Bunks with full over full x's 2 = 4 full beds! The laundry facility with stack full size washer and dryer complete the second floor. We have all tiled floors and wood stairs so no allergy ridden carpet in our home! Come stay and play, and make unforgettable memories at Destination Vacation!